Yesterday I attended the NNECL National Network for the Education of Care Leavers conference at the University of the West of England (UWE). NNECL was established in June 2013 by higher education institutions and national organisations committed to the progression and support of Care Leavers in higher education. 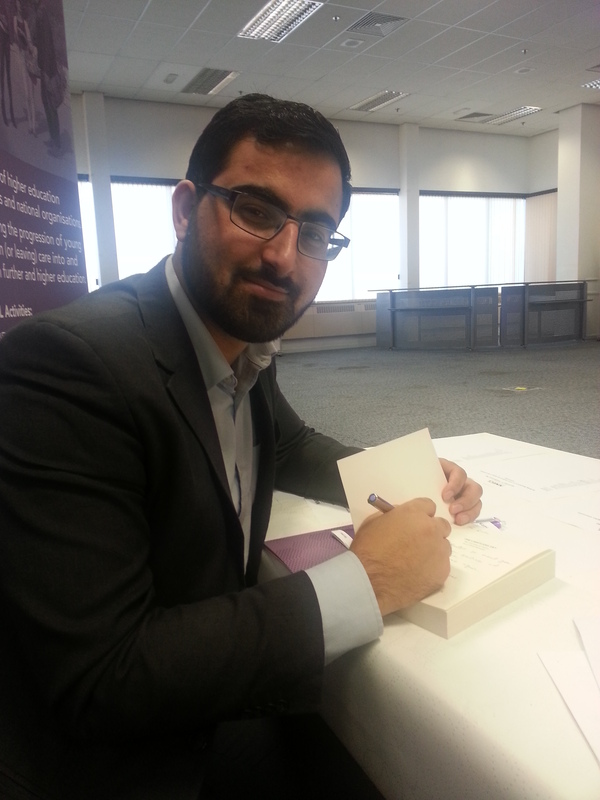 I knew that Care Leaver author, Gulwali Passarlay who wrote The Lightless Sky, was attending the event as we had already made contact via Twitter. As soon as I saw he had arrived, I went over to introduce myself. Gulwali shook my hand and said how pleased he was to meet me, because I am a writer. I felt very moved and said, no no, you are the writer! He is a fireball of enthusiasm and passion and when I suggested we do an impromptu interview, he agreed. I’m very pleased to welcome him to the blog today. 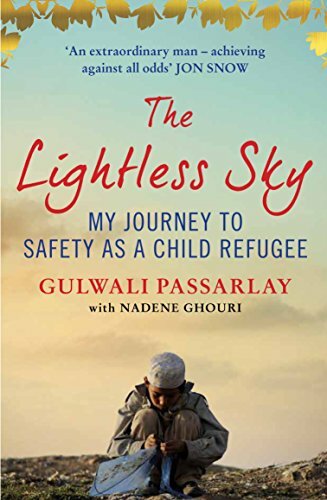 Gulwali Passarlay’s memoir is about how he was sent away from Afghanistan at the age of twelve, after his father was killed in a gun battle with the US Army. Smuggled into Iran, Gulwali began a twelve month odyssey across Europe, spending time in prisons, suffering hunger, making a terrifying journey across the Mediterranean in a tiny boat, and enduring a desolate month in the camp at Calais. Somehow he survived, and made it to Britain, no longer an innocent child but still a young boy alone. In Britain he was fostered, sent to a good school, won a place at a top university, and was chosen to carry the Olympic torch in 2012. Gulwali wants to tell his story – to bring to life the plight of the thousands of men, women and children who are making this perilous journey every day. One boy’s experience is the central story of our times. This memoir celebrates the triumph of courage and determination over adversity. I never imagined going to university or writing a book. It’s now been published in seven countries and six languages. I had just left foster care and was living on my own. I was in my final year at college studying A levels and was very stressed as I was a refugee and didn’t know if I’d be able to stay in the country. I had applied to go to Manchester University and also for funding via Article 26, which works with universities to promote access to higher education for people claiming asylum. Three days before my interview I was suddenly granted refugee status which meant I could attend university as an ‘ordinary’ student with ‘home’ fees! I went to university to thank the Article 26 people plus it was my interview day. However, on the way I met Julian, the Director of Widening Participation, then later on he got me in touch with communication people who wrote an article about my journey on the university news where I was described as “the most remarkable student”. This led to a TEDx talk and eventually an agent in the states who put me in touch with Nadine Ghouri who co-wrote the book. If I hadn’t gone into uni to thank and meet Rebecca Murray* from article 26, than I wouldn’t have seen Julian the Director, therefore no press release, no article or TEDx talk and finally I wouldn’t have been seen by the agent in the states who thought it was worth writing a book about my journey. The moral of the story is little actions with good intentions and for the right reasons makes a difference and will have a positive outcome. I want to do what is right in life not what is easy. Sometimes we have to take a chance, and not expect anything in return. Do it because it’s a nice thing to do. We can help and support refugees and those in desperate need. It’s our moral duty. I am the human face to the statistics and numbers. I am a voice for the voiceless. I feel like they do have a voice but they’ve been silenced. I’ve become an unofficial spokesperson for refugees and I take that very seriously even though it’s not my job. If I don’t do it who else will? I was very busy with my studies and I had been having a lot of conversations with Nadine Ghouri, co author, by telephone and via Skype. It was difficult. We decided to go to Gladstone’s Library and stay there for three weeks to finish the book. They treated us really well and their hospitality was wonderful. I still go back to visit. The three weeks were very emotionally challenging, as it was hard opening up about my past and trusting someone. At times I wanted to stop, because of reliving the journey but there was a pressure from the publishers to submit 80,000 words. We ended up writing much more and the book has over 110,000 words. I had to re-visit the trauma, I didn’t want to talk, I wanted to move on and forget it. It was much more emotional than I thought it would be. Remembering, the hellish – hardship – cruelty – being shot at – it was not something I thought I would talk about again. Twice I tried to commit suicide while being detained in the UK. The immigration officials would not believe my age and wanted to send me back. They had no sense of compassion. I was seen as a liar, de-huminised, told to stop acting and eventually I thought what was the point of life. Everything changed for me when somebody believed in me and that person was Katy Kellet, the Head Teacher at Starting Point who said: ‘I believe you’. Anyway, back to Gladstones, Nadine and I were working hard on the book. I wished I didn’t have to write it, I wished I didn’t have to re-live the experiences. But now it is over I am pleased to be able to inspire people especially refugees and care leavers. Research has shown that care leavers who succeed often have a significant person who believes in them. Nadine needed a lot of patience. At one point Afghanistan were playing cricket in Scotland, I was supposed to attend. I try to watch them wherever they are playing. Anyway I kept looking at Twitter until eventually she asked me to put my phone away! I was very sad to leave Gladstone’s Library. Even though we still had the proof-reading to do, I couldn’t believe we had written a book. I couldn’t believe I was an author. It’s a big thing to write a memoir. I had a sense of pride, of achievement but mentally I was drained. At times I thought, oh no, everything is in the book! Have I done the right thing? The process was so hard. Nadine worked so hard, she too is passionate about helping refugees. She had spent time in Afghanistan and believed in me. She had so much passion, enthusiasm and engagement, reading the text word by word. What message do you have for Care Leavers? When I was at Manchester University out of 50,000 students there were only twenty-one care leavers and it is not enough. The care system seems to be a societal problem. There is a system in place but it is broken. The cycle it seems will not be broken. Sometimes care leavers have children that then end up in care themselves. But by not moving them around to so many foster carers, this would give them the stability that they need. We need an outstanding care system to look after them and make them aspirational. I remember when I was in college and saw the careers advisor who, when I said, I wanted to go to university told me: ‘You should have a plan B’. It is of course not all down to the system, care leavers too need to be inspired and empowered, to believe they can be anything they want to be. I was very lucky that I had good foster parents who supported me. And look at me now! Thank you Rosie for having me on the blog today. *Rebecca Murray founded Article 26 in partnership with Nicholas Sagovsky and is the project’s Director. It is named after the article of the Human Rights Act which says everyone has an equal right to access higher education based on merit and not on class or ethnicity.